Leaves of Grass is a poetry collection by Walt Whitman. 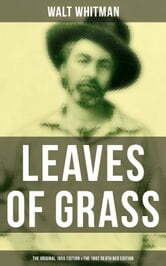 Though the first edition was published in 1855, Whitman spent his entire life writing Leaves of Grass, revising it in several editions until his death. Whitman was intentional in not organizing the book in any chronological way. Instead, he was concerned with the journey of the poetry. He desired that the reader would see a self formed through the words and themes of the book. He writes poems of a political, social, personal, and sexual nature, all ideas that he will elaborate on in later sections. Walt Whitman published and designed The First Edition of Leaves of Grass in 1855. The edition included twelve untitled poems, which were named in later editions. He included no mention of the author, only his name on the copyright and in one line of the first poem, which is later titled "Song of Myself". Whitman's final edition, the 1891-92 edition, also known as "The Deathbed Edition," is simply grammatical corrections of the 1881 edition, and the addition of "November Boughs" as a supplement, "Good-Bye my Fancy" as a second supplement, and "A Backward Glance O'er Travell'd Roads" as the closing essay. Walter "Walt" Whitman (1819 – 1892) was an American poet, essayist and journalist. His work was very controversial in its time, particularly his poetry collection Leaves of Grass, which was described as obscene for its overt sexuality.